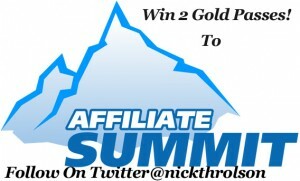 Affiliate Summit West is coming up so here is your chance to win 2 passes. There will be 2 winners one pass will be given to each winner. Follow @ nickthrolson on twitter. Contest will be using http://twtaway.com to pick ?the winner make sure you use the hash tag when entering how we keep track of the entries.